The national publicity secretary of the Association of Nigerian Authors (ANA), who is also the national President of the Society of Young Nigerian Writers (SYNW), Mr. Wole Adedoyin has emerged as the governorship candidate of the Hope Democratic Party (HDP) for the September 22 Osun state governorship election, reports ITRealms. The party’s publicity secretary in the state, Mr. Dada Olusegun told newsmen yesterday in Osogbo that Mr. Wole Adedoyin, a former pioneer Secretary of Oyo IPAC (Interparty Advisory Council) and former CNPP (Conference of Nigerian Political Parties) Secretary emerged at the party’s primary held on Wednesday 18th of July. The primary was supervised and monitored by four INEC representatives. Mr. Wole Adedoyin was 2008 recipient of the Oyo State Merit Award in Literary Art and was also nominated last year for the prestigious Future Africa Award in Education category endowed by the University of Sussex. He is also a foundation member of the working committee of the Nigerian Content Consultative Forum ICT (NCCF ICT) and Association for Information and Communication Technology for Local Content (ICT LOCA), initiatives founded by Nigerian Content Development and Management Board (NCDMB) under the political administration of President Goodluck Jonathan to ensure that ICT practitioners are allowed to benefit from the Nigerian Oil and Gas Industry Content and Development (NOGICD) Act. Mr. Adedoyin has Chaired political parties like Democratic Front for People Federation (DFPF), Peoples Mandate Party (PMP), United Progressive Party (UPP), African Peoples Alliance (APA) and Hope Democratic Party (HDP). According to Mr. Dada, the primary which outcome was accepted by all members was peaceful and democratic. He said delegates from fifteen local governments were accredited and at the end of the exercise, Mr. Wole Adedoyin emerged as consensus candidate of the party. 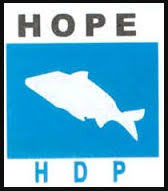 Mr. Olusegun Dada said that HDP is the only party that meant well for the masses and urged the people to vote for her candidate comes September 22 and continue to support it.